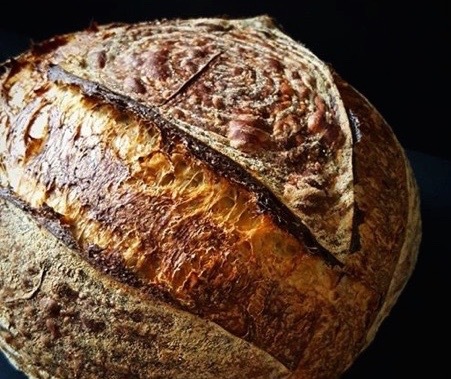 A Sourdough Starters takes on the flavors of its local environment. The American Culinary Federation invited Michael to the University of Missouri to work with James Beard chef-nominee Josh Galleano. Together their menu paired local grains with proteins and vegetables from the country’s heartland. Michael baked a different bread for each course, each one based on his sourdough starter. Translated as “Bread from a Natural Leavener”, this classic French bread has a pleasant chew, mild sourness, and nutty sweetness. It’s adaptable to shape and weight and it readily accommodates solids like olive and rosemary or walnuts and raisins. From Lombardy in northern Italy, with its capital city of Milan, comes this festive bread. Garnished with dried fruits and nuts, any number of versions can be found throughout the Piedmont region. With espresso or tea, it’s a late afternoon treat. During the Christmas holidays, it’s a welcome house gift. 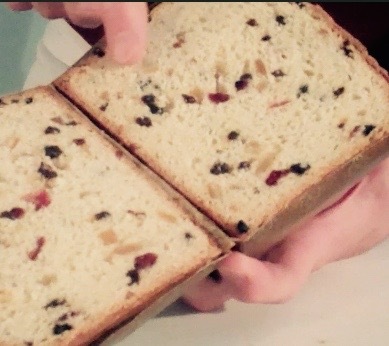 Traditional panettone is made from a madre, or sourdough starter. Michael captures the style by using the Sponge technique, a quicker and easier method. It doesn’t replace the original but is a quick and easy way to capture fuller flavor in the bread without overwhelming the butter’s delicacy.